BTC/USD is being traded at $3,777 as part of a correctional flat. Over the past day, changes in the cryptocurrency market are minor. The last two days there has been a low activity of the participants when moving sideways. Capitalization during this time decreased by 3.9% to $125B. After the entire market has been reduced to levels more than a year ago and on a neutral news background, participants trade in a range. The continuation of the lateral movement in the coming days is still the most likely scenario. As part of the forecast for December 6, we can expect the continuation of the correction within the limits of the trading range of $4,500 – $3,600. The signal area is located at $4,056 – $4,025. This is a dynamic zone of the “balance” of the asset price for the next day. The price will tend to return to this value after moving higher or lower it. For now, it is lower and it is likely that the price will re-test it, and then go to update the bottom $3,700 – $3,600. An alternative would be to continue the development of a full upward correction. To start with, the price will need to break through $4,500 and go to the first goal of $4,740. We can expect growth in the resistance zone of $5,500- $5,000 later on. ETH/USD is being traded at $104.27 as part of a correctional flat. The technical picture for the last trading day has not changed. The price is within the trading range. Exit from it will show the direction of further movement. Due to many negative factors, the fundamental component of this coin is very weak today. Therefore, it is extremely important to see any confirmations of hints of a trend reversal. However, uncertainty in the actions of buyers for a long time suggests that we have not yet seen the bottom. Marks for updating the lows remained the same. These levels are $99.00, $89.00 and $83.70. As part of the forecast for December 6, we can expect the continuation of the correction within the trading range of $130.00 – $100.00. The signal area is located at levels $113.80 – $112.70. This is a dynamic zone of the “balance” of the asset price for the next day. The price will tend to return to this value after moving higher or lower it. For now, it is lower and it is likely that the price will re-test it, and then go to update the bottom $103.50 – $100.00. XRP/USD is being traded at $0.34243 as part of a correctional flat. Over the last trading day, the coin also showed no changes in the technical picture. As part of the lateral movement quotes formed a short-term downtrend, but now prices have come close to support in the $0.33500 area. Therefore, a further decrease may significantly slow down. At the moment the price of the coin goes along with the market. But given the strong fundamental factors, there is still a chance that in the long run, the coin has a good chance of showing the dynamics better than the rest of the market. As part of the forecast for December 6, we can expect the continuation of the correction within the limits of the trading range of $0.40500 – $0.33000. The signal area is located at $0.35715 – $0.35300. This is a dynamic zone of the “balance” of the asset price for the next day. The price will tend to return to this value after moving higher or lower it. For now, it is lower and it is likely that the price will re-test it, and then go to update the bottom $0.32500 – $0.31000. 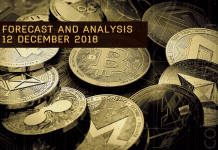 XMR/USD is being traded at $52.272 and continues to move in a bearish trend. The price of the coin has updated the bottom and currently does not plan to stop. The nearest strong support is at $46.000. Perhaps the price will meet it at higher levels. We are waiting for quotes to find a new bottom. After that, we will follow the possible signals either to the reversal of the trend or to its continuation. As part of the forecast for December 6, we can expect the continuation of the downward movement. The signal area is located at $56.700 – $55.750. This is a dynamic zone of the “balance” of the asset price for the next day. The price will tend to return to this value after moving higher or lower it. For now, it is lower and it is likely that the price will re-test it, and then go to update the current minimum of $52.000. Marks for falling levels are $50.000 and $46.000.